I tried this halwa in microwave and it came out very well!! I took this recipe from a magazine.I did some modifications and tried!! Very simple & easy to do:)Mine is a 700w Power output oven.Here I’ve mentioned the time it took.Based on ur model,Please vary the setting time. 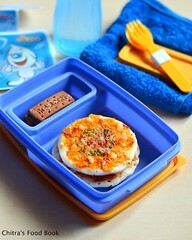 Take the Green Peas/Dried peas with water in a microwave vessel and close it . MICRO- HIGH for 8 mins.Stir once in the middle. Take the cooked peas out and let it cool down. Grind the peas to make a paste using 1/4 cup of milk. Dilute the milk powder(I used amulya) in little lukewarm milk so that there will be no lumps. Now take the ground paste,dissolved milk powder & the remaining milk(1 cup) with sugar in a microwave vessel. MICRO-HIGH for 12mins with lid open by stirring once in the middle. Now take the thickened halwa out and make a dent in the middle. Pour the ghee and add the pieces of cashew,dry grapes & cardamom powder into it. MICRO-HIGH for 4 mins with lid open. Remove the vessel and keep it as such for 2 mins(standing time). Grease a plate with ghee and spread the halwa into it. Delicious,healthy Peas halwa is ready to eat!!! 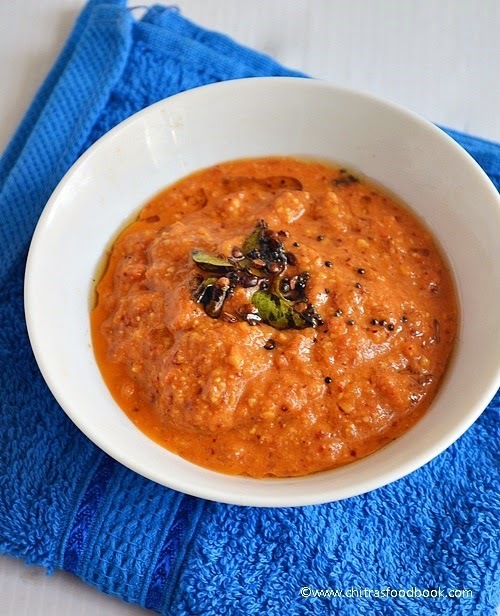 I learnt this tomato chana dal chutney ( Thakkali Kadalai paruppu chutney in Tamil) from my MIL.We usually make this chutney for morning breakfast as a side dish for idli. 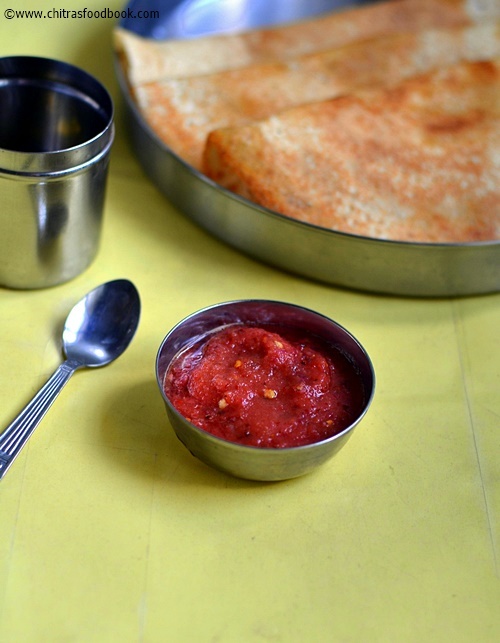 U can try this tomato chutney recipe without coconut too. Tastes great in both the ways. 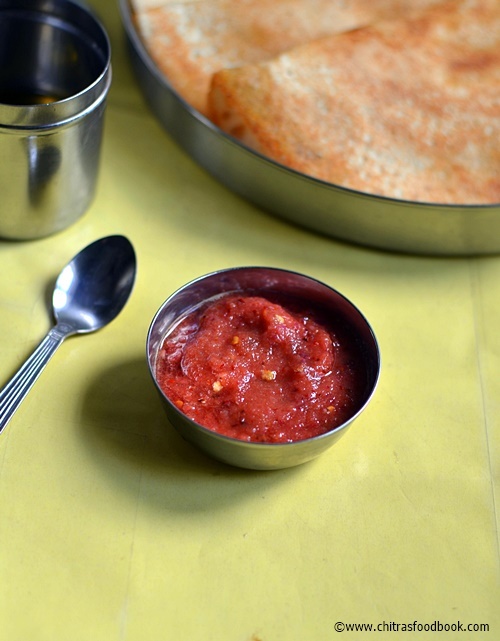 Yummy side dish for idli.dosa - Tomatoes,onions roasted & ground with chana dal & chillies. Wash and chop tomatoes & onion.In a kadai,Heat 2 tsp of oil in a kadai and roast red chilly, chana dal and hing in the same order. Do it till channa dal turns light golden brown color with nice aroma. keep it in a plate. In the remaining oil ,add the onion and saute till golden brown. Now add the tomatoes and cook till soft. Remove and cool it down. First grind roasted channa dal,red chillies with hing.Coarse grind it.Then add sauteed tomatoes,onion with coconut(if using) & salt.Add little water & grind it to a paste. Finally, season with mustard,urad dal & curry leaves. Adding grated coconut is optional here.I don’t add usually.But it helps to balance the spiciness if it is more. For variations,u can add a tsp of dhania while roasting chana dal.It will give a nice flavour. My mom makes this spicy raw onion chutney (Chinna vengayam chutney) in South Indian style along with coconut chutney for idlis & dosa. She makes it with small onions, red chilli and tamarind. We call it as vengaya chutney in Tamil. 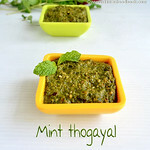 Its very easy to make & it tastes great with hot idli drizzled with lots of sesame oil. This pacha vengaya chutney is my most favourite chutney recipe. 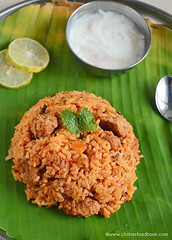 To me, its the best side dish for idli dosa in the world ;). I can have any number of idli or dosa with this raw onion chutney. It tastes good for one day travel too. Lets see how to make this yummy,easy raw onion chutney recipe with red chilli. Easy onion chutney recipe using raw onions in South Indian style. In a mixie jar,take all the ingredients given above.Grind it to a smooth paste adding required water.Enjoy with hot idlis,dosas adding few drops of gingely oil.Gingely oil helps to enhance its flavour while eating.So don’t skip it.Adjust the quantity of chillies as per your need.If u reduce the chillies,the smell of onion will be dominating.To balance the taste,use right quantity of chillies & tamarind. 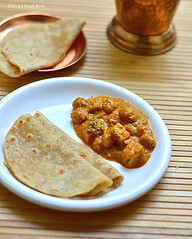 Enjoy my favourite spicy onion chutney with hot idlis.It tastes heavenly !! 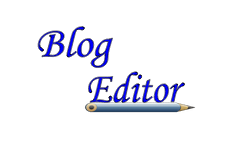 Making a super soft idli batter at home using idli rice in Indian wet grinder is a tedious task for beginners. But its not a big deal if you follow the right proportion for making idili batter. Idli is the staple breakfast recipe of our family. Before marriage , I have seen my mom grinding batter in alternate days and that too using a big wet grinder.Thank god we have got table top wet grinder nowadays. We used to eat idli twice a day for breakfast as well as dinner. Most of the times I carry idli and milagai podi for my lunch in school and college. My friends used to call me "idli " ;)). I love idli like anything. 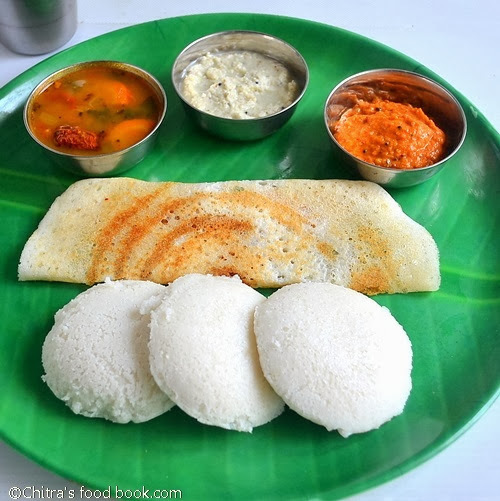 I am crazy about soft idli and spongy uthappam .I don’t like crispy dosa, strange is it??. Soft idli is a must for my dad . My mom doesn’t add methi seeds/vendhayam. She uses only idli rice and white urad dal in the ratio of 6:1. After marriage , its the same case in my husband's family too. So I enjoy idli thrice in a week. Usually my in-laws buy 10kgs of urad dal and 25 kgs of idli rice (salem rice/ parboiled rice/ puzhungal arisi) for the whole year's use in the month of february from Lee Bazaar , Salem. 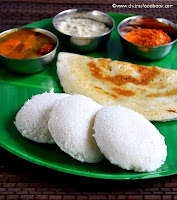 Usually fresh, new, good quality of groceries will be available in the month of february - march.We buy in lots , store in an air tight box and use it for the whole year.The quality of dal will be too good , price is also very less.We use 8:1 ratio of rice and urad dal for making idli batter for few months.Idli comes out really soft. After 4-5 months as the dal gets old ,we use 6:1 ratio. Based on the quality of dal , we adjust the ratio.In addition to rice and dal , we also buy mustard seeds, methi seeds, jeera, pepper, red chillies and stock it for the whole year. So, if u want to buy fresh groceries , buy it in the month of february - march from a whole sale market in ur place, sun dry them and stock it for an year. It stays good for more than 6 months.Ok,enough of my stories.Lets see how to make soft idli & crispy dosa at home with tips & tricks!! Wash and soak the rice.Wash and soak urad dal & methi seeds together. Soak for 4 hrs . Grind urad dal with fenugreek seeds first by adding enough water in between.Make sure u add water every now & then so that the urad dal rises well and u'll get a light , fluffy batter. Please do not add all the water in the beginning.For grinding urad dal , u need 1.5 - 2 cups of water in total . Grind till it comes out like a ball(should be a paste) (It takes nearly 15-20 mins in table-top wet grinder).Now remove it .Keep it in a big vessel such that it can hold double the quantity of batter. Now add the rice & crystal salt with 1/2 cup of water while the grinder is running. Add water in the middle (Whenever necessary).It should become a smooth paste (May take 20-25 mins in table-top). The water it consumes will be around 2- 2.5 cups.Adjust the water quantity. Now remove the rice and put it in the same vessel. Mix it thoroughly with your hand. (This helps for fermentation) .Let the batter ferments overnight or at least for 12 hrs. The next morning , don’t mix the batter again. You can mix till half way through the batter if its too light. Suppose if the batter is over flown, take the extra batter in a separate vessel. Use a ladle, mix the batter till half the way. Quantity of batter reduces. Now add the overflown batter, mix well and keep it aside. Start taking the batter from one corner and pour it into the idli mould. 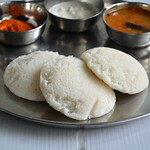 Even the next day,take the batter from the same side.IDLI remains very soft up to 3 days. 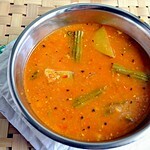 Steam it in the idli pot for 10-15mins and serve hot with sambar!! 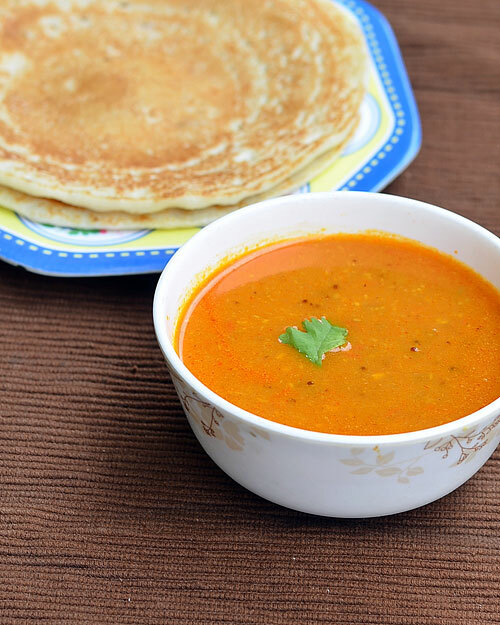 If u want to make dosa with the same batter , take the required quantity of batter separately in a bowl and add little water( 1/4 cup) to make it thin and make dosas. U'll get a crispy dosa for sure !! NOTE: Poha/Aval is optional.U can use based on the quality of rice & urad dal.Add 1/4 cup of poha for the above recipe if u wish to use it..
For getting the golden crust for dosas, add little sugar or pinch of jaggery in the dosa batter. Add some poha/aval or cooked rice while grinding to get golden brown dosa. 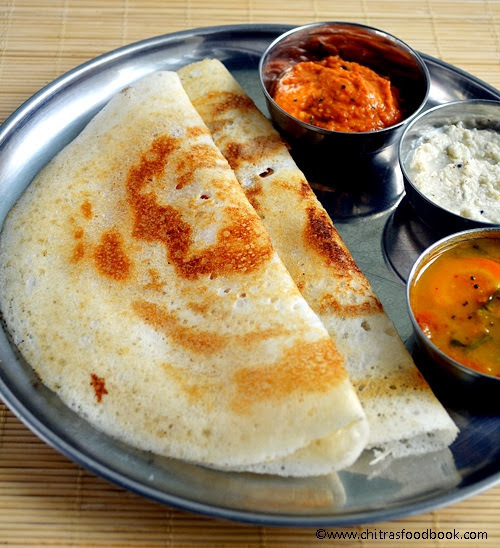 To get crispy dosas with less oil : after pouring the dosa batter , spread it well, keep the flame medium high for 2 mins. The sides will lift. Now flip the dosa , cook in sim flame. Remove. One more method is , just keep the flame high after spreading the batter, drizzle a tsp of oil. 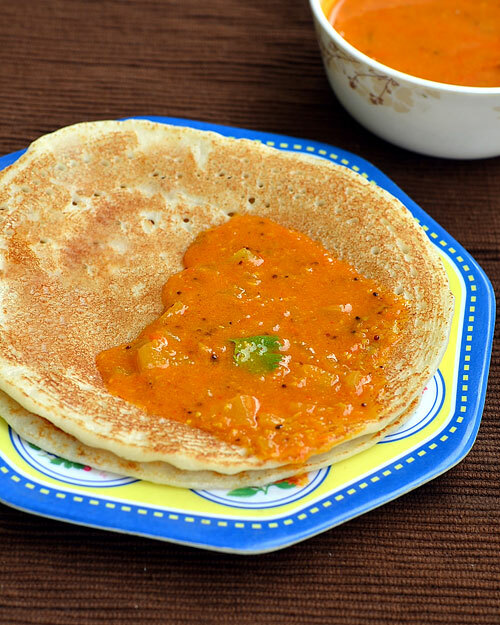 Close the dosa tawa with a lid and cook for sometime. No need to flip.Just remove n serve hot.By this way , u'll get a nice golden colored crispy dosa !! 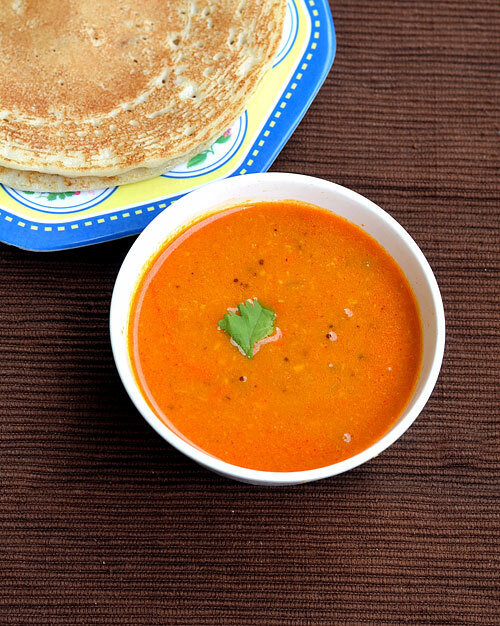 Enjoy Soft idli & crispy dosa with your favorite chutney & sambar ! Generally most of us make chutneys for dosa and rarely sambar. But my husband Sendhil likes to eat dosa with sambar more than chutney. 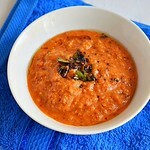 This tomato sambar tastes more like tomato kurma and its my kind of recipe.So I do this sambar specifically for dosa. 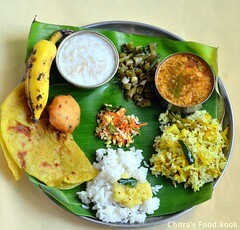 It’s a good side dish for idli & chapathi too. 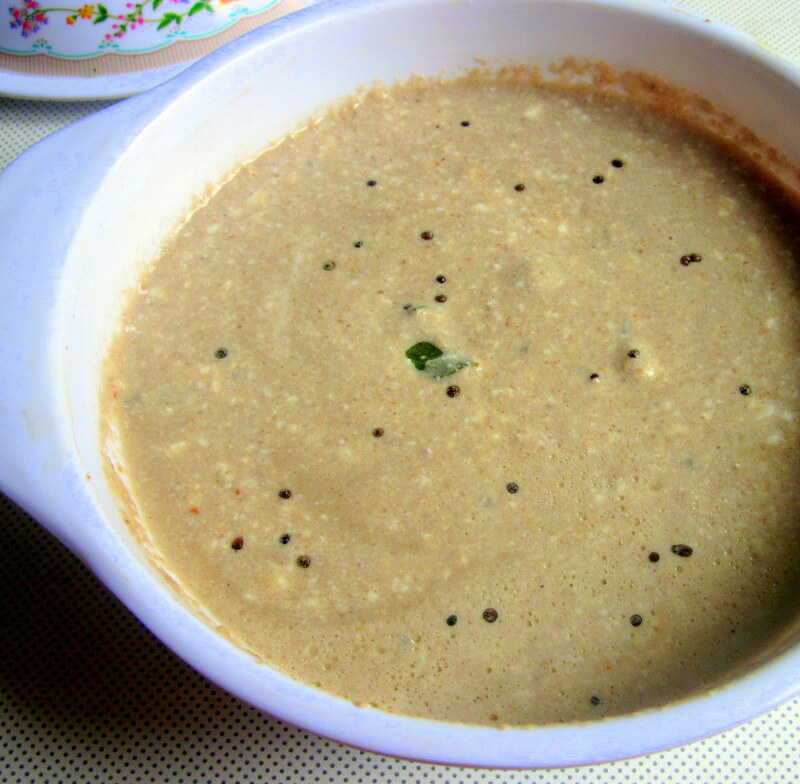 Lets see how to make this kurma kind of thakkali sambar for idli,dosa. 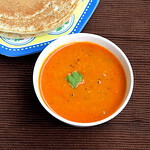 Thakkali sambar/Tomato sambar for idli,dosa - A kurma kind of sambar ! Boil the tomatoes adding 1 cup of water till its skin cracks .After its cool down,grind it along with other ingredients given under “ To Grind” to a smooth paste.Chop the onions finely. Heat oil in a pan.Add the items under “to temper”.Saute the onions,curry leaves and add the ground tomato paste.Add 1 cup of water and salt.Boil well.Garnish with coriander leaves and serve with dosa or idli. 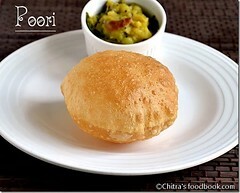 NOTE: If u want to make this for chapathi, add less water and make it thick.Try adding some vegetables! !